If you read this then you must be online and will probably agree that the Internet has become so important to our everyday lives that we can hardly think its living without it. During the Internet's very beginning, it has always been important to be able to find information quickly and accurately. Had it not been for the invention of the search engine, then the Internet would not have become what it had become today. In layman's terms, search engines are like signs and maps, they point us in the right direction of the information that we are looking for. Imagine trying to travel on the M6 motorway (a major road here in the United Kingdom) with no signs or road maps... No one would know when or where to get off to get to where they needed to be. If you can't imagine your life without using search engine, then read on. MJ12node software combines machines from all around the globe to crawl, collate and then send back it's findings to the master server. The crawled data will be analysed (indexed) and added to the Majestic-12 search engine. The result? Hopefully the biggest crawl of the web, and perhaps even the most up to date search engine of it's time. use your otherwise idle computer and broadband connection - you paid for it, why not use it? This inspirational speech is based on original Evil-Dragon's introduction to MJ12node's manual. P.S. 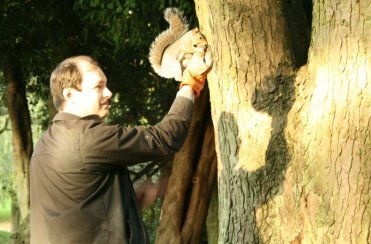 On the photo above you can see Alex Chudnovsky, the founder of the UK's division of Majestic-12, during training session with majestic squirrels (the greys) at undisclosed location.